It’s time to unveil Project ASTRID – Analytic System Tracking Rapid Infant Development. I’ve been working on it for the past two months in my spare time. 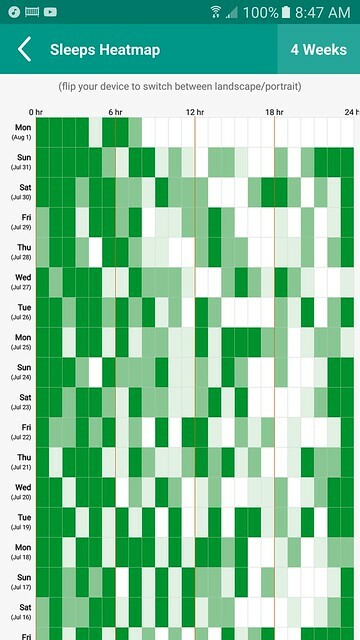 It’s a webapp hosted on Github Pages that visualizes some of the baby data we’ve been tracking. Originally, I just wanted to analyze Astrid’s sleeping patterns, but the website has morphed into a digital baby book with milestones and growth charts. I’m still adding features to it, but it’s polished enough that I’m happy to share it. The chart below is probably the most interesting one I’ve created so far because it quantifies the quality of Astrid’s sleep. It shows her night sleeps, with the longest stretch in blue, the second longest in red, and the remainder in orange. Like all parents, our goal has been to get Astrid to sleep through the night. So that means getting as much blue as possible. On October 7, after weeks of crappy sleeping, we started sleep training with Astrid. We didn’t realize it at the time, but there was a steady improvement over the next month. Then we hit sleep bliss. Astrid slept for 12 hour stretches every night for 3 weeks. We were living every parent’s dream. But last month, we hit the dreaded sleep regression. Luckily it only lasted 2 weeks (although it felt like it would never end at the time) and things have been better lately. We’re still waiting for those consistent 12-hour nights again, but she’s only waking up once a night right now, which seems very manageable. Project ASTRID is open-source and adaptable for anyone else who might want to use it for their own child. Although realistically I know I’m probably the only one who likes having this much data about their baby. I just hope that one day our daughter appreciates the nerdy, data-heavy view of her early life, or at least isn’t completely embarrassed by it. I’ve started paying more attention to the province’s education system since our daughter was born. And it does not look good. Public education in British Columbia is a mess. The BC Liberal government has been systematically dismantling the system since it was first elected in 2001. Looking at the data from Statistics Canada is depressing. From 2001 to 2011, BC and Newfoundland were the only provinces to see cuts to the total number of teachers – but Newfoundland’s population was decreasing during that decade whereas BC added an extra 500,000 people. BC now has the worst student-teacher ratio in Canada, and it is getting worse. BC spends less per student than any province except PEI. Between 2001 and 2006, BC lost 5.9% of its teachers. From 2006 and 2011, the number of teachers in BC fell by another 3.2%. BC now has the worst student-teacher ratio in Canada. 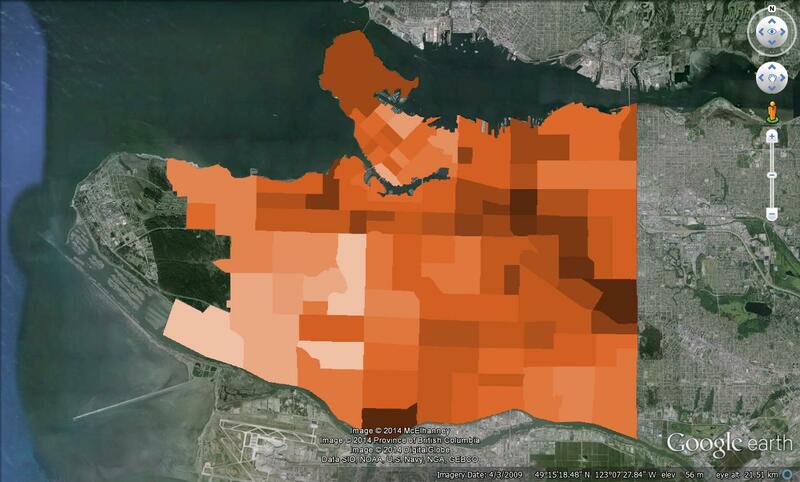 It’s the only province where the student-teacher ratio is getting worse. The BC Liberals and Premier Christy Clark are downright hostile toward the public education system. They’ve torn up teachers contracts (then got in trouble in the Supreme Court), starved local school boards for money and forced school closures, and recently fired the elected school trustees in Vancouver. Not surprisingly, the Premier sends her own son to a private school (which receives generous tax support from the government), so she doesn’t even feel the pain she causes parents and their children. 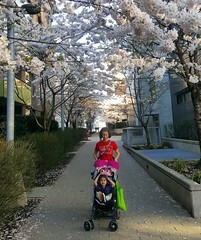 We’re still 5 years away from sending our daughter to school, so there is time for the next government to fix things. I’ll do what I can to ensure the BC Liberals lose the next election. BC desperately needs a change. I’m a proud data nerd, so it probably comes as no surprise that I’m a huge fan of our baby tracking app. 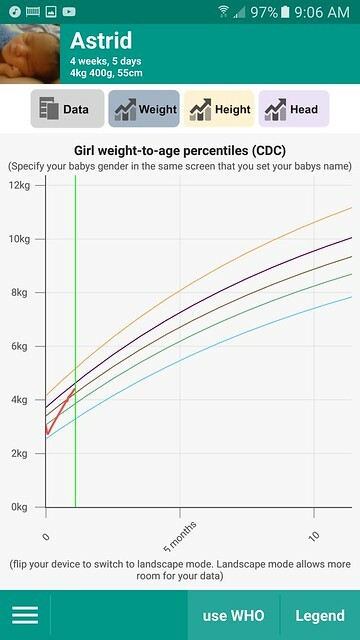 It’s the great aid to my sleep deprived brain and the keeper of our daughters history so far – at least all the important statistics like weight (4.9 kg), height (57 cm), and dirty diaper count (445). We use the Feed Baby app. We paid $4.99 for the Pro version so we could sync data between our phones faster and not have ads but the free version is pretty good. The main competitor, Baby Daybook, looks very similar and I’m not sure there is much that separates them. 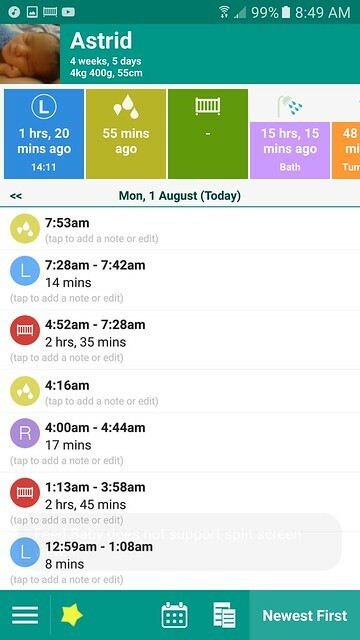 The app’s main day-to-day feature is helping mothers keep track of what side they’ve most recently breastfed the baby on. It’s also a great aid to help decipher the baby’s moods and answer the some key questions. When was the last time she fed? Is she constipated, when did she last poop? Maybe she’s over-tired, how much has she slept today? The charts and statistics have been handy for seeing the patterns in her habits. For example, Astrid’s steadily been getting better at sleeping at night, with longer sleeps and less time awake for feedings and diaper changes. 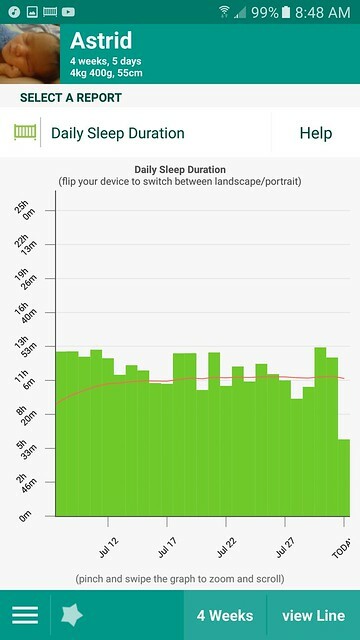 Of course we can feel that, but the data really shows that although there has been a few hiccups, her sleep patterns have been steadily improving. It’s also useful for tracking her weight, height, and head circumference and comparing them against standard growth curves. Astrid started off small and lost 10% of her weight in the first 3 days, but has rapidly growing since then. There are a bunch of features we haven’t used yet, but will as Astrid gets older – like new teeth and vaccine tracking. So if you have a newborn, I highly recommend getting a baby tracking app. It will make your as sleep-deprived life much easier. India is a very cheap country to travel through. Our biggest expense was flying in and out. Surprisingly, even after over 4 months travelling, we paid more for our flights than accommodation or food. So, how much does it cost to backpack through India? Less than $1000 per person per month. Our average daily expenses were $63 per day, and that includes everything – hotels, food, trains, a cellphone with a data plan, haircuts, toiletries, and all of our souvenirs. To put that in perspective, our rent alone in Vancouver costs about the same. Two round trip flights in and out of India cost us only $1,236 each – we got lucky there. Pre-trip expenses like visas, vaccines, and a guide book cost another $342.20. Our hotels averaged 1100 rupees or $22 per night. The beach hut in Gokarna was the cheapest place we stayed, costing only $5. We splurged to stay in a boutique resort for our anniversary in Darjeeling, our most expensive night but still only $55. The hotel in Mumbai was almost as much and not nearly as nice. Trains were the cheapest and most atmospheric way to get across India. We travelled in the unreserved carriages a few times – which are unbelievably cheap but often very crowded. It cost us only $1 each to travel the 250 km between Jodhpur and Ajmer in unreserved second-class. Even our most expensive day train, the high speed train from Amritsar to Delhi, was only $16 a ticket. Our best value was probably the overnight train from Goa to Mumbai, when we paid $11 per bunk bed in a non-AC car. The average overnight train ride in air-conditioned carriages cost $20 each. Our trip slowly got more expensive as we moved north. Our first 50 days through South India were the cheapest – mostly because there weren’t any expensive sights to see and we weren’t buying any souvenirs. Then we hit Mumbai, the most expensive city in India; Agra, with the Taj Mahal and other tourist traps; and Jaipur, where we paid too much money for an elephant experience. The most expensive part of our trip was the 4 days treeking through the Himalayas with porters and cooks, but it was worth it. Unsurprisingly, the bulk of our souvenir shopping happened in the last week of our trip. I’m sure none of the parties are entirely happy with yesterday’s election results. Vision retains control of City Council, with Mayor Gregor Robertson and 6 councillors re-elected, but suffered big loses on Park Board and School Board. 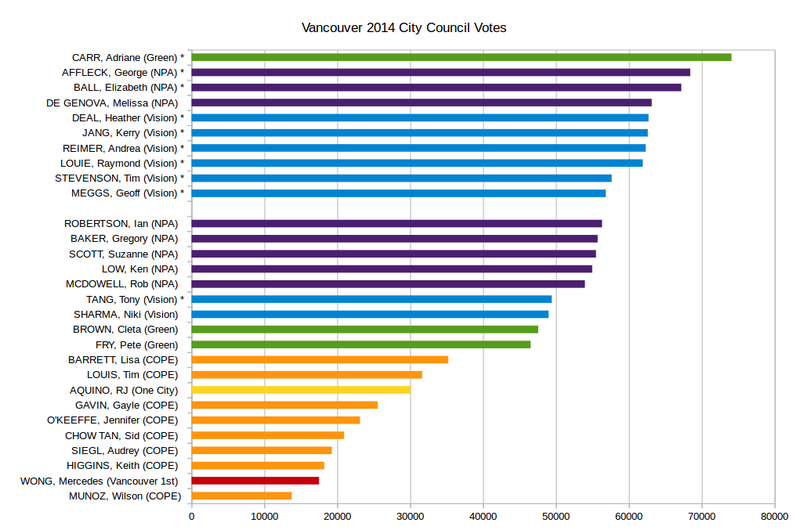 The NPA and Greens both gained seats, but neither had the breakthrough they were looking for at City Council. COPE, and all of the smaller parties, didn’t even come close to electing anyone. Only 11 of the 27 candidates I voted for won, but I’m reasonably satisfied with the results. 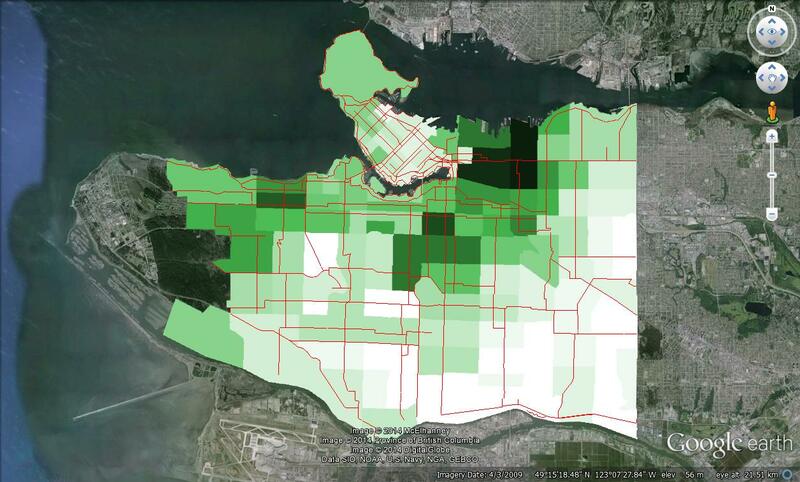 Vision still has a majority at City Council and can continue to push improvements to bike infrastructure and the urban realm. I hope that Adriane Carr will find a way to join Vision on the Greenest City plan instead of opposing it and everything else. I plan on doing a deeper analysis of the election results once the spreadsheets are published to find out what happened (my big questions are listed at the bottom), but here is a quick look at the numbers. 25% more people voted this election than last time. That is huge! In 2011 there were 144,823 votes cast. In 2014 there were 181,707 – 36,884 more. Turnout will likely still be less than 50%, but take it with a grain of salt. People who move away or die are rarely removed from the voters list, inflating the number of registered voters and skewing turnout percentages. Gregor Robertson did well, winning with 83,500 votes (6,500 more than 2011). The narrower victory was a result of COPE not a stronger NPA. COPE’s mayoral candidate, Meena Wong, received nearly 16,800 votes. The NPA gained 15,300 votes, but its vote share only increased by 1%. Nearly 3,000 voters chose “None of the Above” for a mayor, twice as many as in 2011. Only change is Melissa De Genova replacing Tony Tang. Adriane Carr did amazingly well, attracting 74,077 votes from across the spectrum. 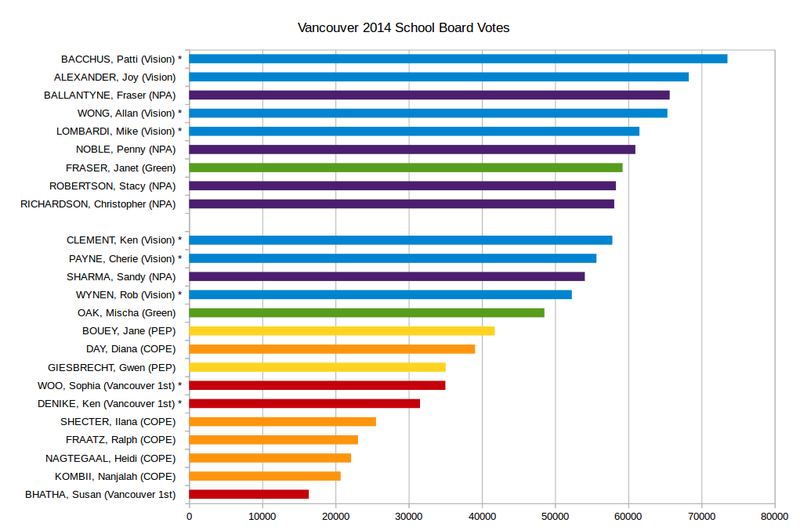 Carr’s popularity didn’t extend to other Green council candidates, who weren’t close. Randomized ballots are needed. Top 5 vote getters have ABCD names. 3 elected NPA candidates outpaced their Vision rivals, but didn’t extend to full slate. Lots of contentious issues: whales in the aquarium, community centre independence, bike lanes in parks. Most disappointed that Brent Granby missed a spot by 1392 votes. Closest race last night: Ken Clement misses last school board spot by 255 votes. Incumbents Woo and Denike (expelled from NPA for homophobic views) are trounced. After just missing spots in 2011, NPA elects Ballantyne and Robertson. Not sure why newcomer Joy Alexander did so well, other than listed first alphabetically. Note: All charts show candidates receiving more than 10,000 votes. Some questions I’d like to answer. How important is being one of the first candidates alphabetically? Where are the regional pockets of support (harder to tell with open voting)? 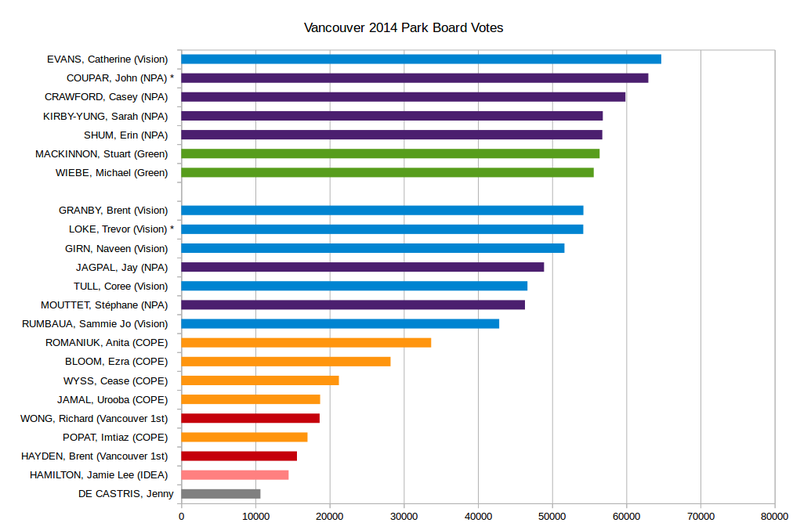 Why did Vision do so bad on Parks Board? Which candidates had the same supporters? 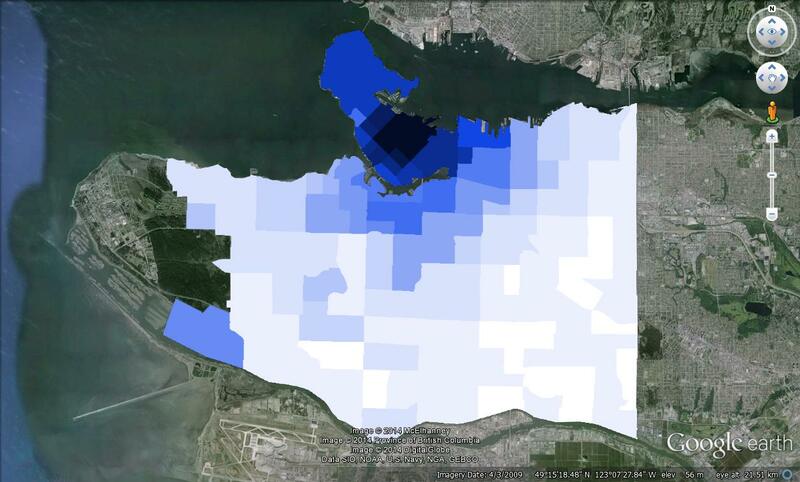 See 2011 council correlations. Was vote splitting a problem?